Industrial heating systems are essential to the day to day operations of facilities in the asphalt industry, refinery industry, tank terminal industry, wastewater treatment industry and beyond. Organizations in these, and other, industries rely heavily on hot oil heating systems to get the job done. When these systems malfunction or break down, productivity decreases and facility operations screech to a halt. Without systems operating at peak efficiency, profitability decreases significantly. Unfortunately, heating equipment inefficiency and breakdown is not all that uncommon and many organizations are forced to operate with heating equipment that is not as efficient or functional as it could be. 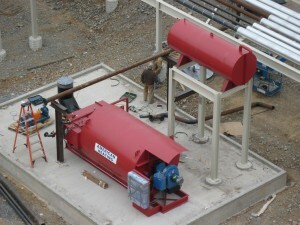 Some common problems that may impact industrial heating systems include process fluid degradation, tube failures, high fuel costs, high stack temperatures (800° F or higher), high maintenance costs, and limited operation at fluid temperatures over 400° F.
If any of these problems are currently impacting your organization, then it may be time to consider a high efficiency industrial hot oil heater or heating system from American Heating Company. Specializing in the design of high quality hot oil heaters and heating systems, American Heating Company has the products to meet your industrial heating needs and solve the problems your facility is currently struggling with. With more than 30 years of operating experience, our finely engineered heating systems can eliminate problems and deliver the highest fuel efficiency attainable today. You can learn more about the benefits of our innovative serpentine coil technology here. Additionally, our hot oil heaters are made in the USA, which means they offer additional benefits over hot oil heating products and systems that are manufactured elsewhere. If you’re looking for an industrial hot oil heater or heating system that offers maximum efficiency and requires minimal maintenance at a competitive price, American Heating Company hot oil heaters are the way to go. Some organizations in these industries still rely on steam boilers to meet their industrial heating needs. If you are one of these organizations and you’re thinking of switching to hot oil heat, we highly recommend you make the switch. Find out why hot oil is better than steam for industrial heating. Let us help you with your search for a heating solution for your facility or plant. 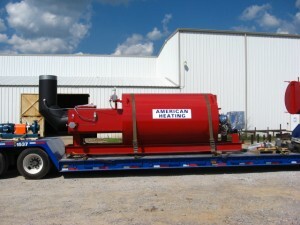 At American Heating Company, we carry a variety of standard hot oil heater models ranging in size from 0.6 MM BTU/Hr. to 50.0 MM BTU/Hr. Need a custom heating solution? With our vast experience and knowledge of heat transfer, we can custom design a heater to fit any of your specific requirements. Custom designed heaters are available up to 200 MM BTU/Hr. or more. Please contact American Heating Company today at (973) 777-0100 to speak with our team about your specific needs and learn more about our heating products. You can also complete our quick and easy online contact form below to get in touch with us today! Looking for Additional Heating Product Information? For more details about our hot oil heaters, be sure to download our informational brochure! Think a complete industrial heating system might be the right choice for your facility? Read more about the industrial heating system components we offer here. Curious about the serpentine coil design featured in our thermal fluid heaters? Learn about the advantages of serpentine coils here.